This trail climbs from the Yosemite Valley floor to the top of the park’s most famous icon, passing two massive waterfalls along the way. 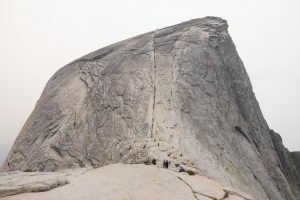 (A permit is necessary to climb the last section to the top of Half Dome. See the park’s website for more details on obtaining a permit before taking off on the trail.) The paved path follows the Merced River and begins level, but quickly climbs fairly steeply through the trees before crossing the river. Stay left onto the Mist Trail towards Vernal Fall. The trail narrows into a canyon where the stunning Vernal Fall comes into view and sprays you with mist as you climb the granite steps (see Vernal Fall in 0-5 Miles). Once above Vernal Fall, continue past Emerald Pool and Silver Apron where Nevada Fall comes into view. Stay left past the junction to cross over the river once again, then work your way through the forest. The trail climbs alongside Nevada Fall giving you really nice views of this even taller and equally powerful waterfall. The trail switchbacks up to rejoin the John Muir Trail. Head west (left) up into the Little Yosemite Valley through a mix of shrubs and forest. You’ll get glimpses of the river and Half Dome as you cruise through this relatively level section of trail. Follow the signs for Half Dome where it begins to switchback out of the valley up to the ridge. Views expand dramatically as the trees thin along the ridgeline and the valleys below become more visible. A sign at the base of the first dome notes that only permit holders may proceed. From here, the trail steeply switchbacks on steps carved into the granite. The views get more dramatic as you climb up the steep dome. The steps transition to slabs of granite as you get to the top of a dome just below Half Dome where the famous cables assist your climb to the top (grippy gloves are recommended for holding onto the cables). The combination of slick granite, volumes of people in both directions, and extremely steep grade make this slow, arduous climb up the cables fairly unnerving. After a patient climb up, you reach the top where you can relax and enjoy dramatic views down the face of Half Dome and panoramic views across Yosemite. Return back down to the junction with the Mist Trail. Instead of returning down the Mist Trail, continue along the John Muir Trail past the junction to the top of Nevada Falls where great views await. Continue through the trees with another amazing view of the waterfall before entering the trees and following the trail back down into the valley (see Nevada Fall Loop for details). 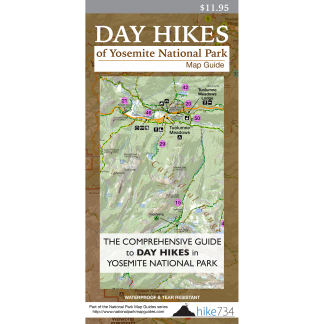 Trailhead: Take the free bus shuttle to the Happy Isles/Mist Trail stop #16, or drive to the trailhead parking past the Half Dome Village and walk 0.5mi/0.7km to the trailhead.